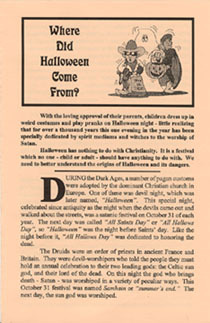 Many times the question has been asked, Where did Halloween come from? Each year children dress up in costumes and play pranks on Halloween night - little realizing its true meaning! Does Halloween have anything to do with Christianity? Can we safely participate in this yearly event? We need to better understand its origins and dangers! First copy FREE, additional copies $.05 each + S/H.